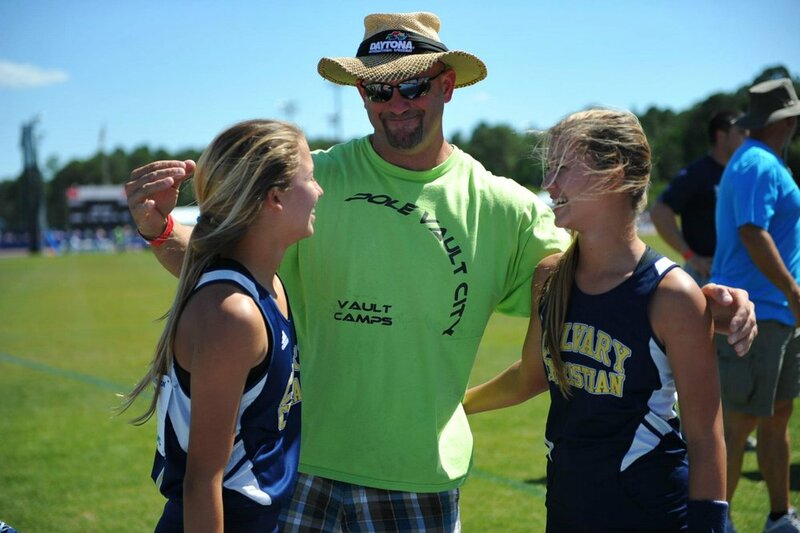 This past May, Amanda and I went back to our High School alma matter, Calvary Christian Academy, to watch the pole vault girls compete in the District Track Meet. This is where we spent many hot Florida days training alongside our teammates and took home the 2012 1A State Champion title for the girls Track and Field Team. 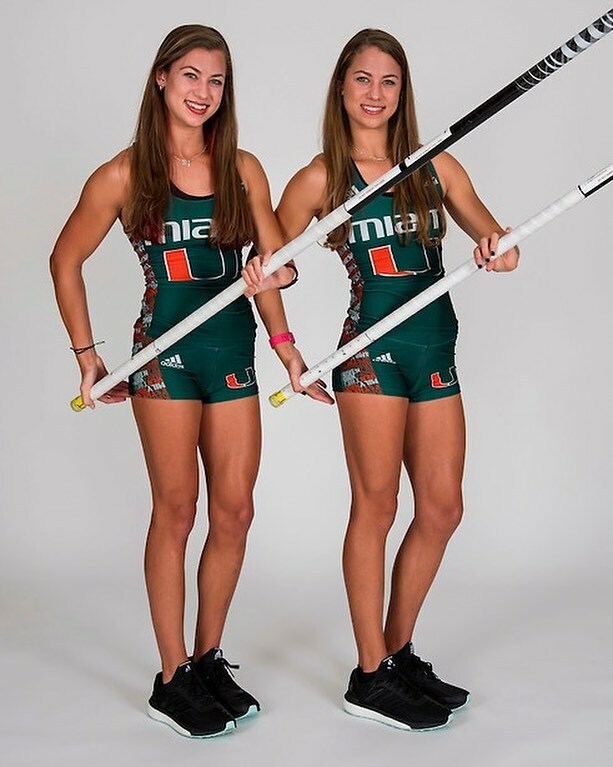 When we weren’t conditioning with the team or sprinting for the 4x1, Amanda and I spent our time three hours north training with Coach Bobby Haeck at his facility, Pole Vault City, in Melbourne, Fl. Bobby played a big role in our lives, mentoring us through high school and helping us reach our goals of getting college track and field scholarships. Although a few years have passed, we still stay in touch. Bobby gave us a call to tell us that he’d be at the District Track Meet with several of his athletes and we were happy to catch up with him there. We caught up on the world of pole vaulting before our conversation turned to fishing. Not only is he the best pole vault coach around, Bobby is also an avid fisherman. He told us that he had a whole set of wahoo lures, planars, and cigar weights, all rigged and ready to be used, and that with his busy schedule he wasn’t getting much use out of them. He offered them to us knowing that we’d appreciate them and put them to work in the Florida Keys. Captain Amanda and I were excited to have a new task…go get a wahoo with new lures in honor of Bobby! Wahoo fishing is an exciting way to fish. This week, the fishing has been a little slow so Amanda and I looked ahead at our schedule and saw that we both had Thursday off. It’s been awhile since we have had the opportunity to fish together for fun. With a southeast wind of 15 knots and predicted 3 to 4 ft seas we knew it was going to be a little rough for our 23 ft Cobia, Gale Force Girls. With this mind, we figured we would stay in closer and fish in 200 ft of water to try for wahoo. It was a good opportunity for us to use our new lures! Wahoo are among the fastest species of pelagic fish making them very exciting to catch. They have an elongated body with razor sharp teeth. The flesh is firm and has a sweet mild taste. It tastes great grilled and is commonly eaten as sashimi. These are just some of the reasons anglers love to catch and eat wahooo! Now there are a variety of ways to troll for wahoo. Some people prefer using lures and trolling at high speeds between 14 and 18 knots. Other people prefer using planars and rigged ballyhoo or bonito strips at slower speeds. I personally have done most of my wahoo fishing trolling between 9 and 10 knots with planars and bonito strips. Our philosophy on fishing is to not overthink the process and don’t be afraid to make mistakes! We put on our sunglasses, buffs and Grundens and headed offshore to about 200 ft of water. Amanda and I chose amongst Bobby’s lures, the pink islander over a silver skirt in hopes to tempt a wahoo from below. We ran between 10 and 12 knots for about one hour trolling east off of Big Pine Key before we had our first bite. We had a FISH ON! I grabbed the rod and Amanda asked what I thought I had hooked up and I knew it was a wahoo! She put the boat in neutral so I could fight the fish. It never gets old when your fish gets closer to the boat and reveals itself. Indeed we had a wahoo! Once at the boat, Amanda gaffed the fish and pulled it in the boat. After a few high-fives we put the fish on ice and trolled a little longer. Feeling content that we accomplished what we set out to do we headed back home. There was plenty of fish for dinner, plenty to share with friends, and enough left over to freeze for later. 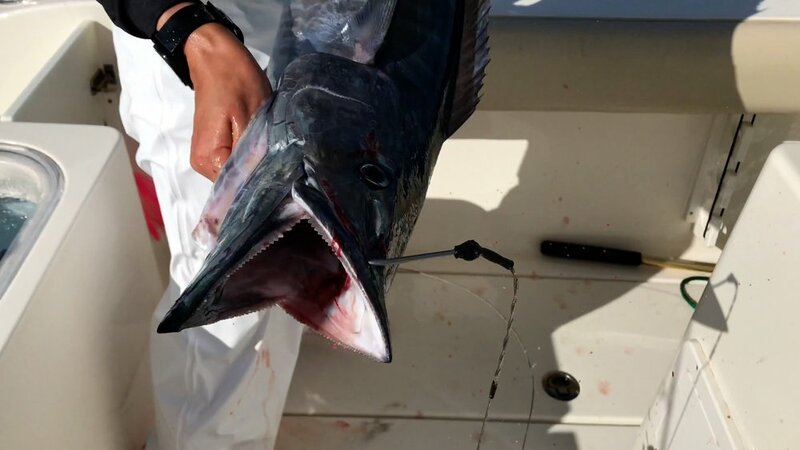 Whether you’re a seasoned fisherman, a novice, or somewhere in between, catching a wahoo is always exciting! Click here or scroll down to watch the video!